Get your Apps Lollipop Ready !!! Android Lollipop which is Android 5.0 has come into the market with amazing new features , we at Quintet can help you develop your app on this new OS platform version by Android. If you have an android app at the Play Store, you will need to update it so that it will work for Android 5.0 because the existing apps may not work fully , or may misbehave or crash on Android 5.0 lollipop. Quintet is here to help you out with this. We will make your Android app 5.0 compatible. Android 5.0 Lollipop gives a smoother experience, the UI design is more colorful, bold and responsive. It is more in-tune with the users natural responsive motion. With realistic shadows and lighting it will be a pleasant experience to navigate your device. Lollipop responds to your touch faster and more easily. You can take advantage of its fluidity while developing an app for Android 5.0. Material Theme – The material theme gives your app a new look and style , it has a system widget that will allow you to set their color pallet and default animations for touch feedback and smooth activity transition. View Shadows – Along with the X and Y properties , views in the Android Lollipop have a Z property now , this means a developer can add an elevation to the view. You can control the size of a shadow or the drawing order. With Android Lollipop, you can respond directly from your lock screen , and also you can select certain people and notifications to get through , use this to your advantage while developing your app. Priority mode is a new feature which will allow only priority messages in your phones scheduled downtime. Device Sharing is now possible through Android Lollipop. Android 5.0 users won’t have to worry about leaving their phones behind at home when they are at office or forget it somewhere. They can still access any of the messages and photos by simply logging into another device which has Android Lollipop. Now families can share one single phone using multiple logins, and most importantly you can lend your device and not your personal stuff which you have stored in your phone. Notifications can now be controlled based on the priority of the app you set and what you want to see. The user also has the permission to turn off the notifications. Users can spend more time gaming thanks to the new battery saver feature that can extend the time to upto 90 minutes. Besides that users can enjoy a faster and smoother Android runtime and enjoy a faster , smoother and powerful computing experience. Now you can develop games with peace of mind. Android 5.0 Lollipop gives you an advantage of bolder graphics , improved audio , video and camera capabilities when you create your app. With Android TV in the market , and Android Lollipop offering support to it , we can foresee a whole scope for apps that can be modified or created to cater to this new market. Another reason why Android Lollipop is so hot is because of its amazing security feature. 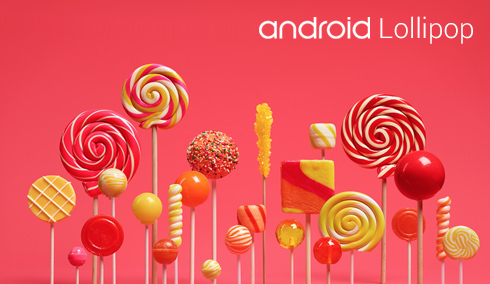 Android 5.0 Lollipop comes with an opt-in ‘Factory reset Protection” option . This will discourage thieves from stealing your phone , because the thief won’t be able to wipe your phone or do a factory reset through recovery mode. With Android Lollipop you can easily manage multiple payment apps by quickly switching between them. Its as simple as tapping and paying. Now you can get paid faster on your online mobile app store. Using Android Beam, you can now share a file with someone nearby by simply tapping the two devices together. Android Lollipop which was named Android L during preview, now comes in over 68+ languages with 15 new languages supported Basque, Bengali, Burmese, Chinese (Hong Kong), Galician, Icelandic, Kannada, Kyrgyz, Macedonian, Malayalam, Marathi, Nepali, Sinhala, Tamil, Telugu . Now while developing app you are able to cater to a bigger audience. Android Auto was developed by Google and will have a new Android Lollipop version shortly to be operable on automobile dashboards. It enables driver to have more control over GPS maps and navigation , music , sms , telephony and web search.Everything can be controlled over voice commands so that the driver and passengers are safe while driving. Android Auto now is a part of Open Automotive Alliance which consist of 28 automobile manufacturers . Cars supporting Android Auto will be launched late 2014 onwards.